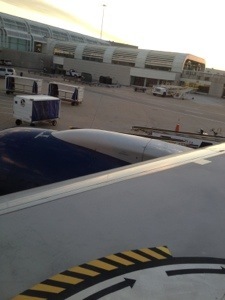 Well here I sit on a plane heading to California. We’re delayed. This certainly does not surprise me considering the weather throughout the USA. I’m thankful it is delayed and not cancelled. Prayers are like that…some just delayed, but others denied (cancelled). The airlines cancel flights for our safety. God denies some prayers for our safety. If you are wondering why He said No, remember it is because God only wants what He knows is best for you.